A Captain Morgan son and MacGyver Grandson--Dominator is true to his name in the show ring, with 3 Reserve Championships, including the 2005 Futurity and North American shows. Known for luster and fine, pencilled locks, his offspring are awesome! Marguerite comes from impressive stock with multiple championships in her lineage. 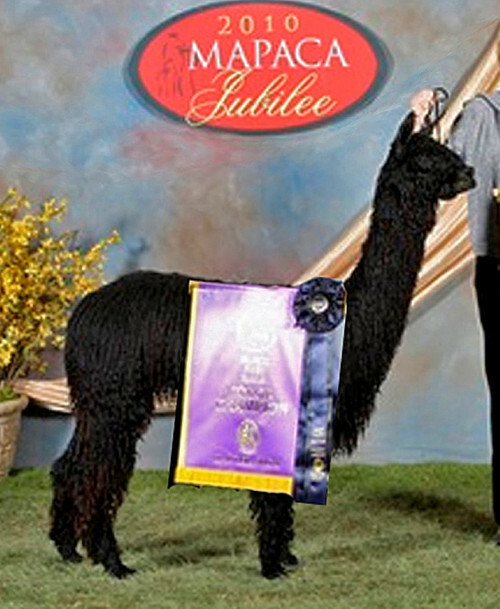 Marguerite took the Reserve Color Championship at the 2003 AOBA, with blue ribbons at the Empire Alpaca Extravaganza and the Virginia Classic in 2003. She has produced several champion offspring, as well. Hmmmm, so why did a huacaya breeder buy a Suri herdsire?? Look for yourself--he's an outstanding example of black Suri genetics!! I figured our Western State Suri breeders could use a magnificent male like this to bring color, conformation and LUSTER into their herds. 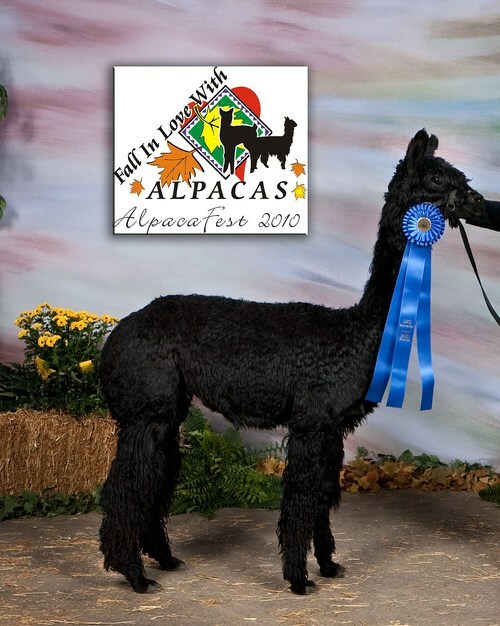 I'm so excited that Kathy Stumpf of Prairie Lake Alpacas in Maryland allowed us to purchase this fabulous guy! Before she let him go West, she bred him to her girls and he has 4 confirmed pregnancies in Maryland. When she bought him from Ameripaca, Kathy said, "When we saw this male, we knew we had to have him! We purchased him just before he entered the show ring at Mapaca. Solid, true blue-black with locking to rival any white, Marauder impressed the judges as well! Champion at 2010 Mapaca, the judges comments included that he was the 'most unique black male they had ever seen in any country!' They liked him so much that they kept him in the ring after naming the Judges Choice winner to specifically call out his attributes to the audience and stated later that they would have named him judges choice, but, due to the fact that he had been belly shorn, they had to give it to the other male as they could not adequately compare density..."
And check out his histogram---An AFD of 20.8 at 22 months of age in a BLACK SURI?!! WHOOOO-EEEE!! 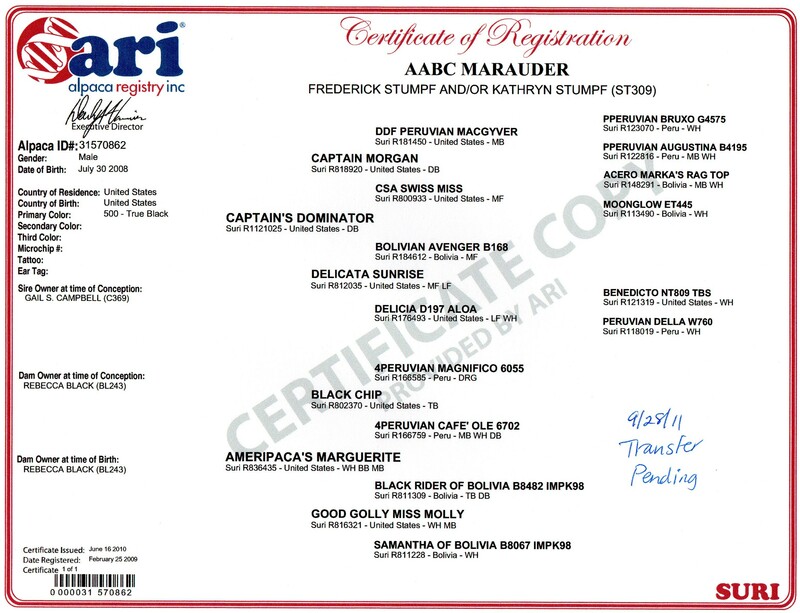 Marauder has his first crias born on the East Coast--lustrous offspring with strong conformations, and BLACK! They will be contenders in the show ring in the fall. More crias to come in California this autumn. 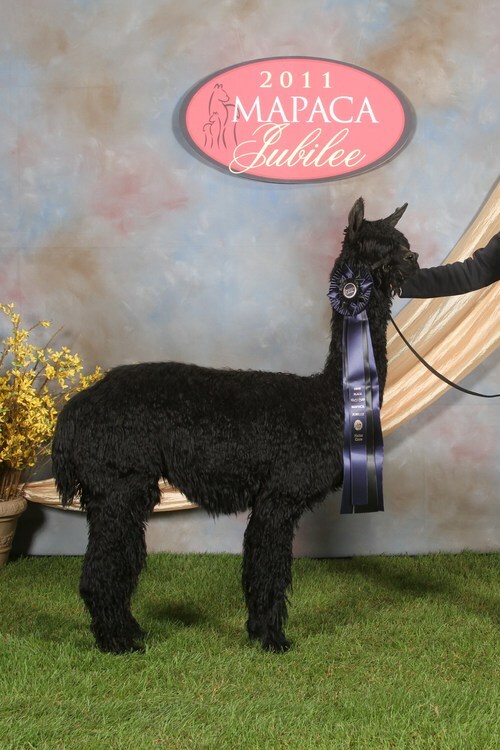 2012 update--Marauder's full sister, Ameripaca's Mona Lisa, just took a blue ribbon in halter competition at the Nationals! 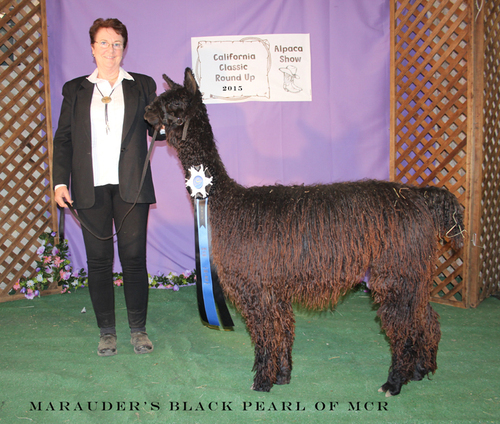 Marauder is co-owned with Jan and Dale Davis of Derwydd Alpacas. He's moving to coastal Marin County, north of San Francisco, in early June, 2014. Champion "Bling" with Color Genetics!